The project aims at a new generation middleware platform (UBIWARE) which will allow creation of self-managed complex industrial systems qconsisting of distributed, heterogeneous, shared and reusable components of different nature, e.g. smart machines and devices, sensors, actuators, RFIDs, web-services, software components and applications, humans, etc. UBIWARE will enable Global Enterprise Resource Integration (GERI). Unlike EAI solutions, which are concerned with integration of computer systems only, UBIWARE aims at integrating all types of resources found in an enterprise: digital, physical, and humans. Due to UBIWARE, resources are able to communicate globally, i.e. across the whole enterprise and beyond. Also, the resources get “globally” integrated, i.e. they not only communicate, but also flexibly coordinate with each other, discover and use each other, and jointly engage in different business processes. Work in this project is divided into seven workpackages which will be running in parallel. UBIWARE will require the reliable core platform to enable semantics-based proactivity and coordination of the components (workpackage WP1) and tools for managing and integrating distributed histories of the components (workpackage WP2). It will also require essentially new solutions towards security, service provisioning and information integration. Ubiquitous computing environment demands ubiquitous, yet flexible, security with respect to all kinds of interactions, based on well-defined and machine-readable policies (workpackage WP3). In UBIWARE, there is a need for new solutions towards self-management, configuration and integration of the components (workpackage WP4) and flexible semantic interfaces to deliver the integrated data to different human users having different backgrounds (workpackage WP5). UBIWARE should allow resource discovery not only based on centralized registries but also on the peer-to-peer basis (workpackage WP6). Finally, the middleware should be tried on real industrial cases to evaluate the scientific concepts behind it and facilitate its further utilization (workpackage WP7). The development of the project's underlying system is divided into 3 years, which are outlined below. Each year of the project is based on previous results and delivers more enhanced version of architectural design for the UBIWARE. 1. How the languages, developed in SmartResource project, have to evolve to meet the full spectrum of requirements expected from the UBIWARE platform? 2. How to semantically markup the history of a resource in a system, in order to make it reusable for other resources and at the system-level? 3. What mechanisms are needed for effective and efficient sharing of information between the platforms representing different resources? 4. What would be appropriate general security and privacy infrastructure to treat the questions related to Access Control in UBIWARE ? 5. How to make resource adapters to heterogeneous industrial resources configurable for UBIWARE ? 6. How to utilize the 4i approach for development of appropriate GUIs (and human adapters) for UBIWARE ? Also during the 1-st year we will perform industrial cases analysis, design and development based on data provided by industrial partners, i.e. identification of relevant industrial resources, their dependencies and interactions and connecting UBIWARE platform to these resources through development of appropriate resource adapters. During the first year of the project, one of the IOG members Artem Katasonov has been visiting USA with a purpose to disseminate results of the project and continue cooperation with research groups from MIT. Artem had meetings with Tim Berners-Lee and Lalana Kagal (CS and AI laboratory) and with Edmund Shuster (Data Center - a part of Laboratory for Manufacturing and Productivity) and presented current research and development of the project. 1. How to realize organizational policies as restrictions put on the behavior of individual agents? 2. What mechanisms are needed for flexibly treating the potential (and likely) conflicts among the S-APL models (roles, policies) used by one agent? 3. Is it possible and if yes then how to implements a mechanism so that agents could “see” what other agents are doing, in so creating the basis for coordination through observation in addition to traditional coordination through communication? 4. How to realize the possibility of querying a set of distributed, autonomous, and, hence, inevitably semantically heterogeneous resource histories as they were one virtual database, i.e. how to collect and integrate needed pieces of information from distributed sources? 5. How a component of a system may realize the need for re-configuration of itself of the integral system, i.e. when the previous configuration of one or more components does not seem to work anymore? 6. What mechanism are needed for (re-)configuration of the integral system through local decision making of and supported by communication between agents representing components of the system (i.e. with no central decision maker)? 7. What should be the architecture of MetaProvider-services so that they will be able to effectively retrieve, integrate and deliver the context information both to for presenting to humans (in a visual form) and for agents’ processing (semantic data)? 8. What should be the architecture of the Intelligent GUI Shell, so that it will allow situation-dependent selection of MetaProviders (i.e. different types of context) and cross-MetaProvider browsing and integration? 9. How to design a P2P resource discovery infrastructure for UBIWARE, including related inter-agent communication protocols? Analogously to the 1-st year, during the 2-nd year we will perform industrial cases analysis, design and development based on data provided by industrial partners. We will be developing a full prototype application: connecting to additional relevant resources and extending the interactions between them towards a sufficiently elaborated application. During the second year of the project, one of the IOG members Oleksiy Khriyenko has been awarded THE DEGREE OF DOCTOR OF PHILOSOPHY. Scientific postgraduate studies have been fulfilled in the field of Mathematical Information Technology. The dissertation "Adaptive Semantic Web based Environment for Web Resources" has been defended at its public examination on December 13, 2008. PhD Evgeny Osipov (Luleå University of Technology, Sweden) acted as the opponent and professor Timo Tiihonen (University of Jyväskylä) as the chairman. One more great event has taken place during this project year. 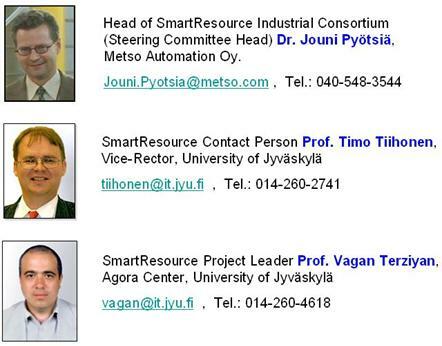 The team leader of the IOG, Vagan Terziyan has been awarded the FULL PROFESSOR POSITION in University of Jyväskylä. The inauguration lecture "Future of the Web: Towards Global Understanding" has been publicly given on May 20, 2009. 1. How to enable agents to flexibly discover each other, based both on the roles played and on particular capabilities possessed? 2. What would be concrete benefits of and what mechanisms are needed for accessing and using a role’s script by agents who are not playing that role but wish to coordinate or interact with an agent that does? 3. How to find suitable agents to perform the task based on the goal specified by the user? 4. What are the ways to transform a goal into a set of scripts to be executed by these agents? 5. Once the system is configured, how to maintain this state even if the circumstances of the system change? 6. What should be the general architecture of the product – 4I(FOR EYE) tool package so that it will be possible to build and further extend a different services based on the product? What are the requirements for the product, for the product components, what are the necessary modifications and the use cases of the product utilization? 7. What are the 4I(FOR EYE) tool/technology commercialization and marketing steps? Following the tradition of the previous years, during the 3-rd year we will perform industrial cases analysis, design and development based on data provided by industrial partners. During the third year of the project, one of the IOG members Sergiy Nikitin has been awarded THE DEGREE OF DOCTOR OF PHILOSOPHY. Scientific postgraduate studies have been fulfilled in the field of Mathematical Information Technology. The dissertation "Dynamic Aspects of Industrial Middleware Architectures" has been defended at its public examination on March 25, 2011. PhD Evgeny Osipov (Luleå University of Technology, Sweden) acted as the opponent and professor Vagan Terziyan (University of Jyväskylä) as the chairman. 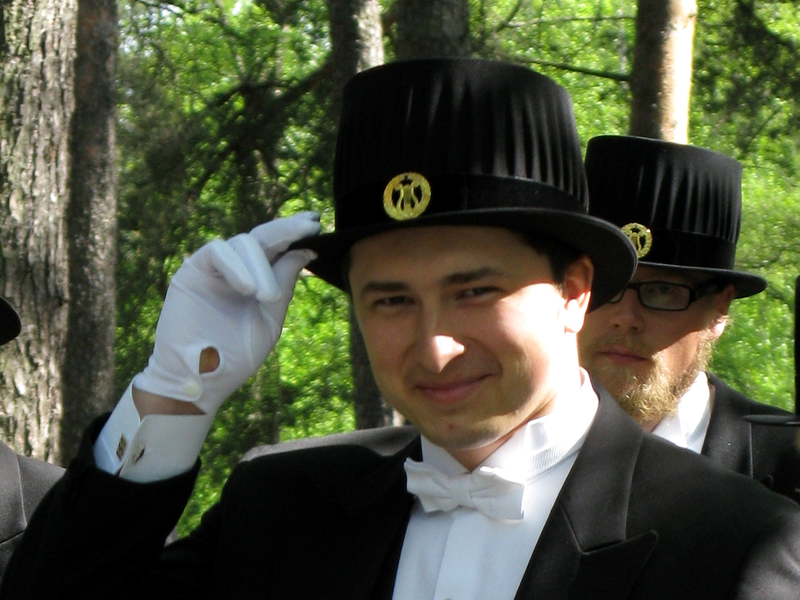 Another team member Viljo Pilli-Sihvola will get his Master Degree in December 2010. The title of his thesis is “Intelligence as a Service”.